Dahl is the simplest Indian dish to cook, and one that is usually better when you make it at home in my experience. Best of all, it won't give you the squirts! 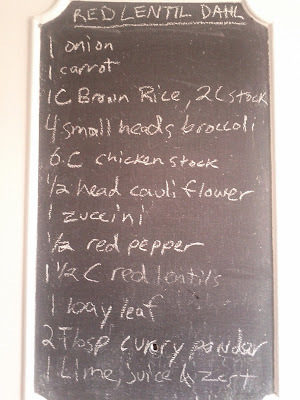 It is a red lentil based canvas you can add any sort of thing you want to. I chose mainly cruciferous vegetables, but use whatever you like. Start by making the rice. I used brown rice that takes about 45 minutes to cook. 1 Cup rice to 2 Cups liquid, chicken stock is really nice, will make perfect rice every time. Add the rice when the liquid is at a full boil, then cover and turn heat to minimum for 45 minutes. Perfect rice every time. Start the dahl by sauteing onions in oil. Add chopped carrots, broccoli stems, curry powder, lentils, hot peppers, liquid (I used chicken stock again), and bay leaf in that order. Bring to a simmer until lentils are almost cooked. Add cauliflower florets, red pepper, lime, broccoli florets, and zucchini. Stir well to break up lentils into a smooth sauce. 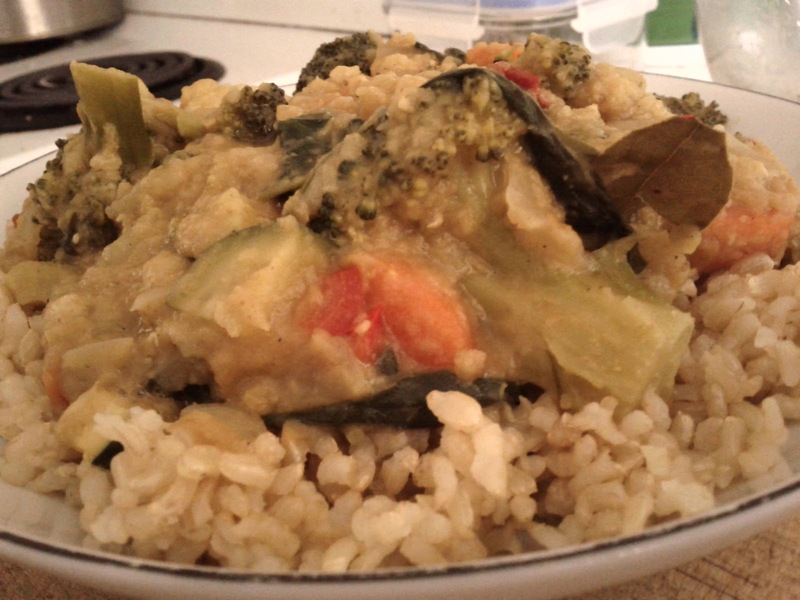 It is a bit ugly, but it tastes good and is quite healthy for you. Ideally, you want to remove the bay leaves before serving them, but I kinda like finding them in there. I would cut up the cauliflower and broccoli into smaller florets next time. They were a bit ungainly and one toppled off my fork to get caught in my beard. The seasoned rice is much better than it would have been plain. Leftovers were just as good, but not as pretty to look at.